Angelina Galashenkova started her musical career at age 7, winning, as a child and teenager, three junior competitions among domra players in the Northwestern part of Russia. At age 17, while studying at the Mussorgsky Musical College, she won second prize and title of Laureate of National Competition of Professional Domra Players in Nizhni - Novgorod, Russia. She was subsequently invited by Dmitri Khokhlov, director of the Andreyev Balalaika Orchestra, to be the orchestra’s guest soloist on several national and world tours, performing with them at Carnegie Hall’s 100th anniversary. In 1991 Angelina entered the Gnessin Russian Academy of Music in Moscow to study domra and minor in piano, spending a year under the tutelage of the world renowned Alexander Tsygankov. During this time she won third prize and title of Laureate of International Competition of Professional Folk Artists “Cup of the North Competition” in Cherepovez, Russia. Angelina has performed with the Police Orchestra of Moscow, in numerous small ensembles, and toured Australia with the Moscow Kremlin exhibition “World of Faberge.” She was also a classical mandolin soloist with the Chamber Orchestra of St. Petersburg, Russia. In 1999 she became a permanent soloist with the Andreyev Balalaika Orchestra, performing with them through Russia and Europe. 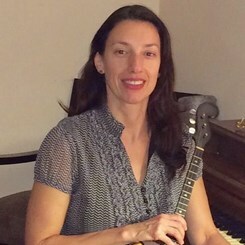 Since moving to the USA in 2001, Angelina has maintained a busy schedule teaching domra and piano, performs as domra soloist and concertmaster with the Atlanta Balalaika Society, and in 2010 formed the domra-guitar duo 9 String Theory with classical guitarist John Huston. Angelina was guest artist and teacher at the 2010 BDAA convention in Minneapolis, and looks forward to teaching domra at this year’s convention, where she will perform with the BDAA orchestra and 9 String Theory. Request Lessons with ANGELINA today!